As the Federal Reserve Bank of New York moved to beef up its oversight of Wall Street two years ago, the team charged with supervising the nation’s largest bank, JPMorgan Chase, was in turmoil. New York Fed examiners embedded at JPMorgan complained about being blocked from doing their jobs. In frustration, some requested transfers. Top New York Fed managers knew about the problems, according to interviews and secret recordings of internal meetings obtained by ProPublica. Similar frustrations had surfaced among examiners at other banks as well. The revelations of internal strife add new details to the summary of an investigation by the Federal Reserve Board’s inspector general into the New York Fed’s supervision of JPMorgan before the “London Whale“ trading scandal. The disastrous series of trades, which became public in April 2012, cost JPMorgan $7 billion in losses, settlements and fines and forced it to admit to securities law violations. In the summary of its two-year investigation, which was released last month, the IG stopped short of saying the New York Fed could have detected the trading risk before it blew up. Still, it chastised the bank, saying it had identified risky activities in JPMorgan’s investment office years earlier but didn’t follow up or tell the bank’s primary regulator, the Office of the Comptroller of the Currency (OCC), as procedures demanded. The IG’s office has withheld its full investigation report, saying it contained information that was “confidential” and “privileged.” A spokesman declined to provide even a page count. The New York Fed declined to respond to detailed questions. JPMorgan also declined to comment. The IG’s summary offered only a glimpse into the job performance of what is arguably the most important U.S. financial regulator. The New York Fed’s primary responsibility is to protect the safety and soundness of the financial system. After the 2008 financial crisis, Congress gave the Federal Reserve System the task of supervising the biggest and most complex financial institutions whose failure could disrupt the economy. Because of its location, the New York Fed has direct responsibility for many of Wall Street’s biggest players. Yet its supervisory culture has been slow to adapt, as ProPublica and This American Life recently reported. To comply with its new Congressional mandate, the New York Fed went on a hiring spree in 2011, in part to bring in more specialized examiners to station inside JPMorgan, Goldman Sachs, Citigroup and other systemically important financial institutions. These examiners, called “risk specialists,” were chosen because of their expertise in areas such as compliance, credit risk and operations. Their task was to continuously monitor their institutions to see how they fared in these key areas. The specialists reported to two bosses 2013 managers for their specialty and the head New York Fed officer at the bank. By early January 2012, it was clear that this dual reporting system had become a problem at several institutions and that on some teams the new experts were encountering resistance from their non-specialist colleagues and supervisors. In a meeting of legal and compliance specialists caught on Segarra’s recordings, examiners complained about management not valuing their expertise and struggles over who had final say over examinations. 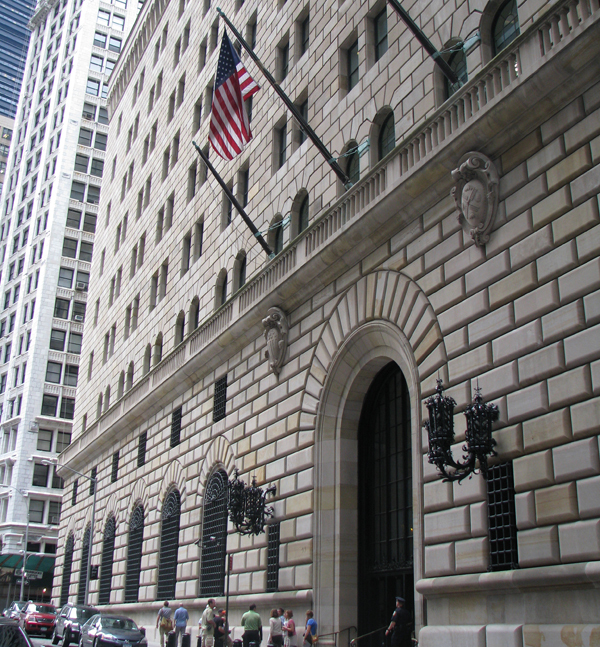 In some cases, the senior New York Fed person on site at the bank would not allow the new examiners to act on their knowledge and work independently. The JPMorgan team was widely recognized as dysfunctional in this regard, according to discussions on Segarra’s tapes and interviews with two former Fed employees, who continue to work in finance and asked for anonymity to discuss confidential information. Segarra had joined the New York Fed as a legal and compliance examiner in November 2011. She was fired seven months later after a dispute with her bosses in which she refused to rescind a detrimental finding about Goldman Sachs. The New York Fed says Segarra’s firing was unrelated to her supervision of Goldman; her lawsuit contesting the firing was dismissed without a ruling on the merits and is on appeal. In January 2012, to build her own record of events, Segarra began secretly recording meetings with colleagues. She was among roughly 230 New York Fed supervisors assigned to the largest financial institutions. The risk specialists were a small subset of that group in a given area were called a “risk stripe.” The members of each stripe from the different systemically important banks met weekly to discuss the issues they were facing on their respective teams. Tensions within the JPMorgan team were common knowledge, according to a former examiner. On the recordings, Kim put the responsibility for the tensions at the JPMorgan team on Dianne Dobbeck, then the senior New York Fed supervisor at the bank. The issue came up when Kim tried to assuage Segarra about pressures she was experiencing at Goldman. In some respects, he said, the situation was worse at JPMorgan. Kim added that the legal and compliance specialist embedded at JPMorgan wasn’t allowed “access to anything 2014 nada.” Dobbeck expected the risk specialists to follow orders, not think for themselves, Kim indicated. “You do what we tell you,” he said, portraying Dobbeck. Kim declined to respond to questions. The former examiner, who was not on the JPMorgan team but maintained good contacts with those working under Dobbeck, echoed Kim’s characterizations. The continuous monitoring that was supposed to take place bogged down when all meetings and document requests had to be cleared by Dobbeck, the examiner remembers his colleagues telling him. “The examination scope was limited even though the point of risk specialists was there was supposed to be no limit to their scope,” he said. Dahlgren declined to respond to questions. The former examiner said that by mid-2012, there was an effort by a number of risk specialists on the JPMorgan team to transfer to other institutions. By the end of the year several left the team to join Fed supervisors at other banks. “A lot of people wanted to leave because they felt their information was getting stonewalled or it was not getting traction,” the former examiner said. Dobbeck did not respond to a detailed request for comment. She is a New York Fed veteran who started as a financial analyst in the policy department in 1997. By September 2005, she had moved to the supervision side of the bank and become the New York Fed’s “Central Point of Contact” for Citigroup. Dobbeck held the job until May 2007, a crucial period for Citigroup in the lead-up to the financial crisis. At the outset of 2005, the Federal Reserve had downgraded Citigroup because of “demonstrated weakness in the company’s ability to comply with all rules and regulations.” By February 2006, the New York Fed determined that Citigroup had made improvements. The Federal Reserve raised Citigroup’s rating. At that point, however, the bank’s production of structured mortgage bonds called collateralized debt obligations went into overdrive. The bank increasingly relied on off-balance sheet entities in which to stash these mortgage assets. When their value plummeted, they flooded back onto the bank’s balance sheets to catastrophic effect. After the 2008 meltdown, Congress created the Financial Crisis Inquiry Commission to investigate the causes. The commission focused much of its Wall Street investigation on Citigroup, which got the biggest government bank bailout from the financial crisis, $476 billion in cash and guarantees. Commission investigators conducted several interviews with Dobbeck, who acknowledged to them that she and her colleagues had missed what was happening at Citigroup. They had looked at mortgages the bank was originating and managing, but not “the potential exposure they had through their structured activity,” she told FCIC investigators. One of the top OCC supervisors at Citigroup at the time was Scott Waterhouse. Years later, in 2012, when Dobbeck ran the New York Fed team at JPMorgan, her OCC counterpart at the bank was again Waterhouse. He did not respond to emailed questions. Last year’s examination of the London Whale trades by the Senate Permanent Subcommittee on Investigations criticized the OCC’s efforts but did not look into the New York Fed. But if the primary regulator, in this case the OCC, fails “to notice and follow up on red flags,” as the Senate investigation concluded, the Fed is supposed to step in, according to a 2009 review by the Federal Reserve Board. Bart Dzivi investigated the New York Fed’s activities as special counsel for the Financial Crisis Inquiry Commission and conducted the panel’s interviews with Dobbeck in 2010. Dzivi told ProPublica that Dobbeck was “smart, pleasant and exactly the wrong type of person to be in charge of any safety and soundness position” because he believed she lacked the resolve to stand up to the banks. After leading the Citigroup team, Dobbeck was promoted to head of the credit risk department for the New York Fed’s Bank Supervision group in June 2007. Two years later she was made a senior vice president. By 2011, Dobbeck was the top New York Fed supervisor at JPMorgan. She left the JPMorgan team in late 2013 for another promotion, this time to be the head of all supervisory policy for the New York Fed. The Fed inspector general’s summary of the London Whale investigation does not name Dobbeck or anyone else, and some of the problems the IG chose to highlight predate her time leading the JPMorgan team. The summary report catalogs several missed warning signs, including reviews in 2008 and 2010 of JPMorgan’s Chief Investment Office that were planned but never took place. The commission’s release of that information in 2011 marks the last detailed public look at the New York Fed’s supervision by a government entity. By comparison, the Senate Permanent Subcommittee on Investigations released more than 1,200 pages of documents, including emails and internal reports from the OCC and JPMorgan, in its London Whale investigation. It held hours of public hearings with key players, including the Comptroller of the Currency Thomas Curry, who pledged to reform his agency and then acted to do so. To date, the only public review of the New York Fed’s handling of the London Whale is the inspector general’s summary report. It is four pages long. For more coverage, see ProPublica’s previous reporting on the New York Fed and Segarra’s secret recordings or listen to excerpts of the Carmen Segarra tapes. Do you have comments or tips about the New York Fed? Contact Jake.Bernstein@ProPublica.org. ProPublica is a Pulitzer Prize-winning independent, non-profit newsroom that produces investigative journalism in the public interest. This article is republished with permission under a Creative Commons license. Sign up for their newsletter. Business Ethics in China: What Would Chairman Mao Think?